Americans would never support a constitutionally ignorant, deficit-spending, authoritarian crony capitalist. Time magazine’s profile of Donald Trump, its Man of the Year, notes, “he has little patience for the organizing principle of the Tea Party: the idea that the federal government must live within its means and lower its debts.” What’s astonishing about this sentence, which appears in a generally fascinating and well-done story, is its casual acceptance of the premise that fiscal discipline is, or was, the tea party’s organizing principle. When the tea party appeared on the scene in 2009, an intense partisan dispute broke out as to just what this movement represented. Conservatives insisted that what spurred protesters into streets and town halls were the timeless principles of conservative movement thought: advocacy of balanced budgets, adherence to a strict constructionist version of the Constitution, opposition to “crony capitalism,” and skepticism of Keynesian economics. Liberals suggested a different explanation. The tea party was an expression of ethno-nationalist rage centered around a black president and the belief that his coalition stood for redistribution from older, white America to its younger, more diverse supporters. 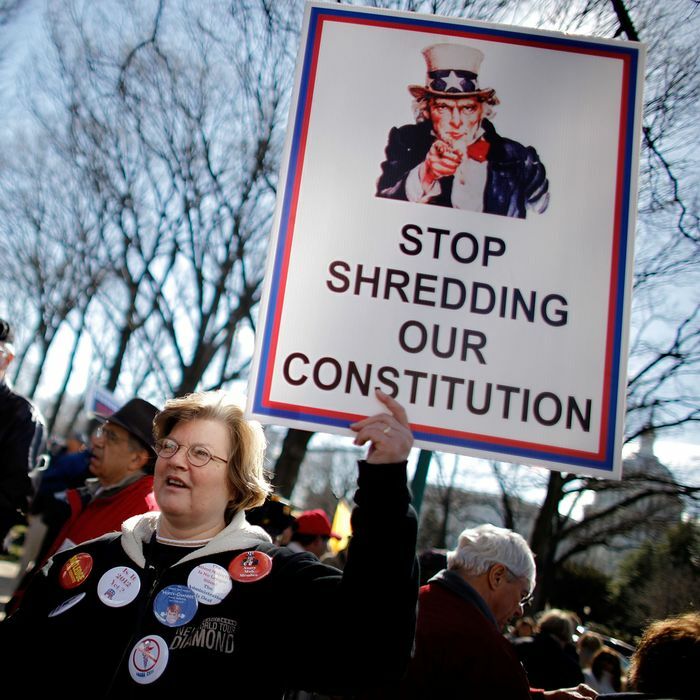 Reports by close students of the phenomenon, like Theda Skocpol and Vanessa Williamson, or Stanley Greenberg, revealed that deep-seated fear of demographic change rather than abstract constitutional or economic principles lay at the heart of the revolt against Obama. Trump is justifying his plans to jack up the deficit on Keynesian grounds (“sometimes you have to prime the pump,” he tells Time), and many have noted the GOP’s sudden reversal on an economic theory it rejected in 2009. But to call this a mere reversal understates the case substantially. Keynesian theory does not advocate deficit spending under all circumstances. It holds that fiscal stimulus is the correct response to a specific, rare emergency: when interest rates are not strong enough to prevent the economy from falling into a liquidity trap. Keynesians can argue about just what conditions are dire enough to justify the strong remedy of deficit spending. 2009 was an easy case, a once-in-a-century catastrophe for which monetary stimulus alone could not hope to suffice. But to support Keynesian stimulus in 2016, with unemployment at 4.6 percent, is a completely different story. That is a circumstance only the most indiscriminate Keynesian — what economists used to call “vulgar Keynesians” — would deem suitable for stimulus. And yet Republicans who rejected stimulus when it was unquestionably necessary have followed Trump’s call to employ it in far murkier circumstances. Perhaps Trump’s most comic violation of so-called conservative principle is his blatant favoritism toward individual business firms. Remember the hysterical fears of “crony capitalism,” and even “gangster government,” when the Obama administration subsidized green-energy technology and prevented the collapse of the auto industry in the face of frozen credit markets? Now Trump is happily embracing specific tax favors for firms that allow him to boast he has saved jobs. One can only imagine the horror Republicans would have displayed if Obama threatened retribution against a firm, causing its stock price to tank, after its CEO criticized his policies. Yet even conservative intellectuals, or pseudo-intellectuals, have cheered him on. When Ted Cruz, self-styled foe of “crony capitalism,” was asked about the special deal for Carrier, he gushed, “I think the American people are gratified to have an incoming president, an incoming administration, that will fight to keep jobs here in America and reduce the burdens on small businesses and job creators so that we see millions of new high-paying jobs and wages rising across the country.” Limbaugh explained to his listeners why Boeing’s political loyalties are suspect and thus why president-elect Trump is clever to punish it. If somebody involved in the tea-party debate of 2009–2010 had predicted the events of 2016, conservatives would have refused to believe it. Hell, even most liberals would have refused to believe it. It’s one thing to suspect tea-party rhetoric was phony, quite another to believe the entire GOP could disregard every single putative principle of the movement even before it had its hands on power. Why is anybody pretending these notions ever really mattered?